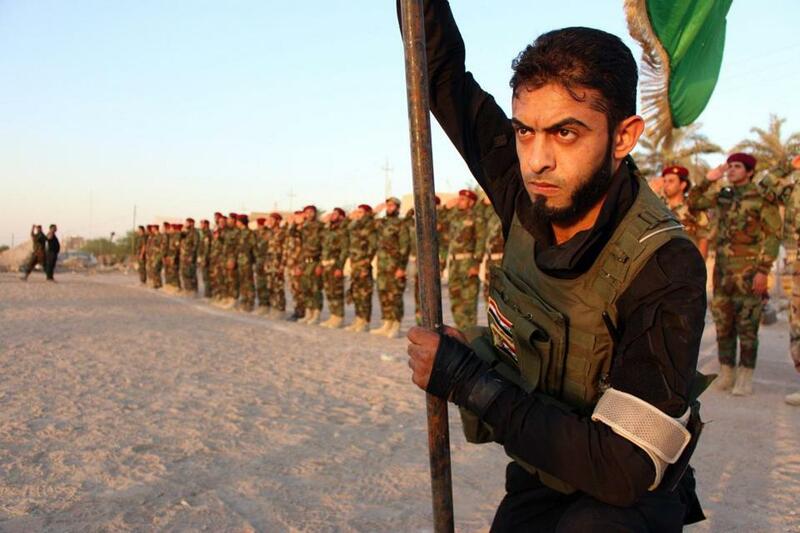 Shiite militia members train in Iraq Tuesday, after Sunni extremists overran key cities. That triumphalism quickly faded as Iraq fell into horrific sectarian strife. Now the blowback has risen to another level. Violent fundamentalists have surged to power in a large swath of Iraq. In barely a decade, our intervention has achieved precisely the opposite of the intended result. We wanted to prevent Iraq from becoming a base for terrorists. Now it is one. Having sown this whirlwind, the United States now faces a challenge to which there are no good answers. Americans are hardly in a mood to send ground troops back to Iraq. Air strikes might be effective in turning back the militant advance, but that would be at best a temporary victory. Insurgent groups would reconstitute themselves and attack again. How many waves of airstrikes, over how many years, are we willing to launch to save a government in Baghdad that has lost the confidence of its own people? The military situation in Iraq is serious, but that is only the country’s most immediate problem. More profound is the political crisis beneath it. The electoral system we imposed after our invasion 11 years ago has failed to tame or reconcile the country. In our narcissistic campaign to remake the world in our own image, we foolishly imagined that political rules that barely work in the United States would produce a placid Iraq. Today, we should do what we should have done before invading: Leave Iraq’s problems to its own people and those nearby. If Iraqis want to save their country, they can. If they can recruit Kurdish allies, win support from Turkey, and draw on Shiite military power in neighboring Iran and beyond, their position is strong — though this conflict will not soon fade away. The United States should resist being drawn in. Any commitment for sustained engagement will repeat past errors. The idea that US military power can positively shape the Middle East is a delusion we should have abandoned long ago. The great danger of this crisis for Americans lies beyond Iraq. It lies in the power of momentary crises to distract us from the larger question of what causes violent explosions in the world. In recent weeks, much attention has been focused on Boko Haram, the terror gang holding more than 200 kidnapped Nigerian schoolgirls. No one seems able to rescue these girls, but could we have prevented the rise of Boko Haram? According to news reports, its heavy weapons came from arsenals in Libya after a US-led coalition deposed Moammar Khadafy three years ago. Weapons from those arsenals were used by militants who seized a Texas-sized chunk of Mali in 2012. Now they are in the hands of fundamentalist kidnappers in Nigeria. Bombing Khadafy out of power may have briefly felt good, but it has thrown Libya into chaos and strengthened some of North Africa’s most brutal terrorist armies. “What’s clear from the last decade is the need for the United States to ask hard questions before we take action abroad, especially military action,” President Obama said Thursday. He did not use the word “blowback,” but that is what he was talking about. Americans have an instinct to act. We don’t like to understand things; we like to do things. Often we lash out in the world without considering what the long-term results might be. Now we have a chance to make the same mistake again. The alternative would be to recognize that the militant advance in Iraq does not threaten our vital interests, and then defer to countries in the region rather than telling them what to do. That would be a welcome departure from our normal approach to the world.